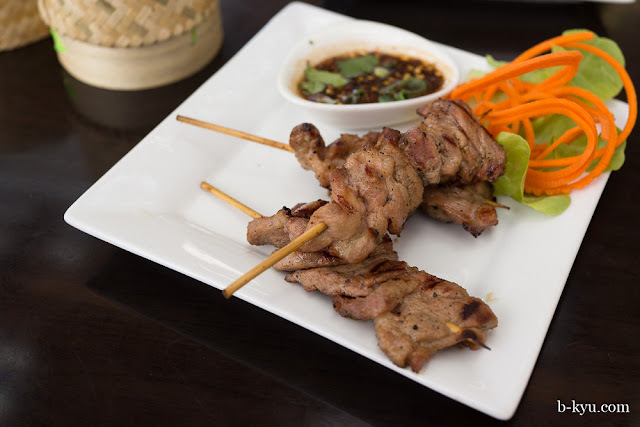 Of all the Thai restos lining King Street in Newtown there is only one we've found that specialises in the spicy Esan food of North East Thailand. Look for the bright pink sign for Saab Wer along the strip. Thai restaurants in Newtown are as common as expensive coffee shops in Chiang Mai and are filled with pretty much the same sort of clean young white farangs. Along the student end of King Street, the Thai lunch special rules supreme. Further down it's birthday party balloon extravaganzas and somewhere for a nice dinner with your Mum and Dad, not too scary. 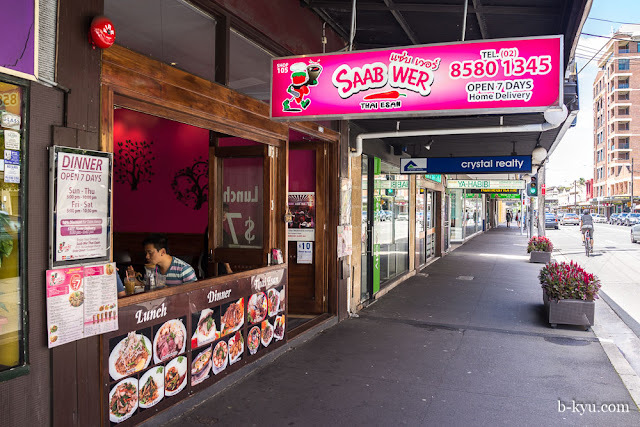 While we sometimes grab a plate at a 'rice and one selection' joint when we feel lazy and need a quick dinner, lately we've been trying out the food at Saab Wer for something different. There's three menus to peruse. 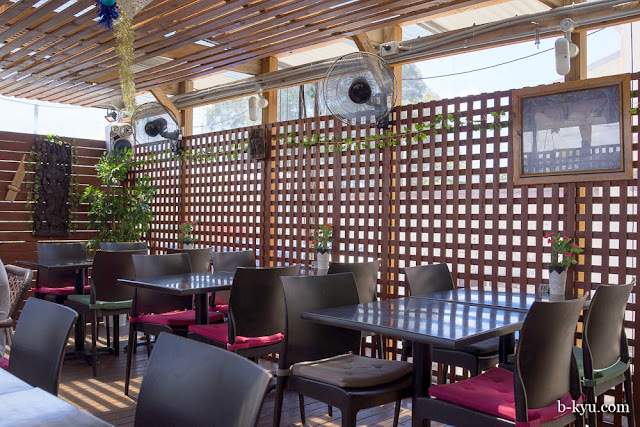 The first is the from $7 lunch special menu which features all the usual Thai selections and it's good value. 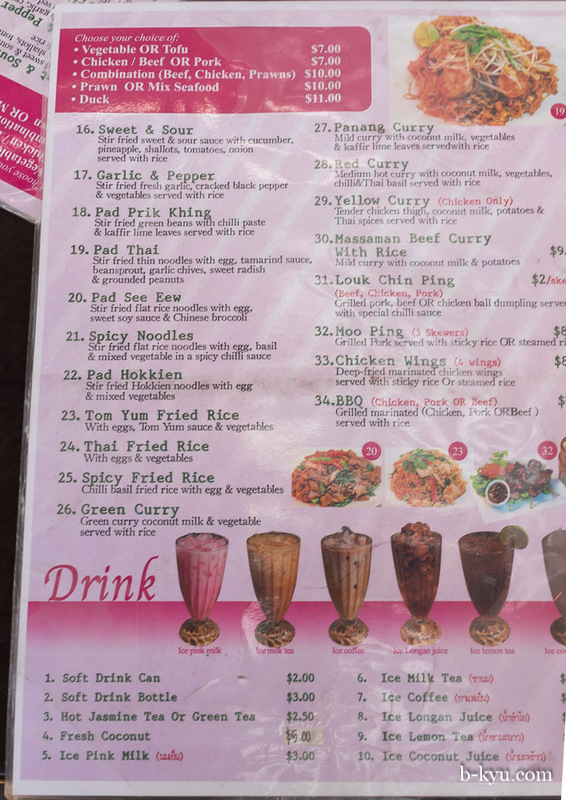 Noodles, curries and stir fries are the main deal here. 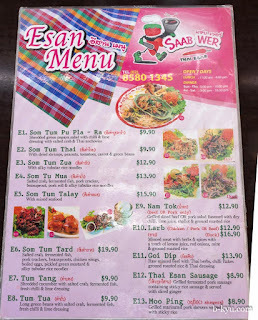 You might need to ask for the Esan menu if it's not given out straight away, and while it doesn't have the same $7 value meals it does have an excellent range of salads (som tum), steamboats, soups and skewers. At night there is a dinner menu to replace the lunch specials. Inside the walls are the same bright pink as the street sign, and the open street front windows let in fresh air and light. The outdoor courtyard is more pleasant than expected and they can stick tables together for big groups. The boss randomly appeared with dessert for everybody in the courtyard, we'll take it. 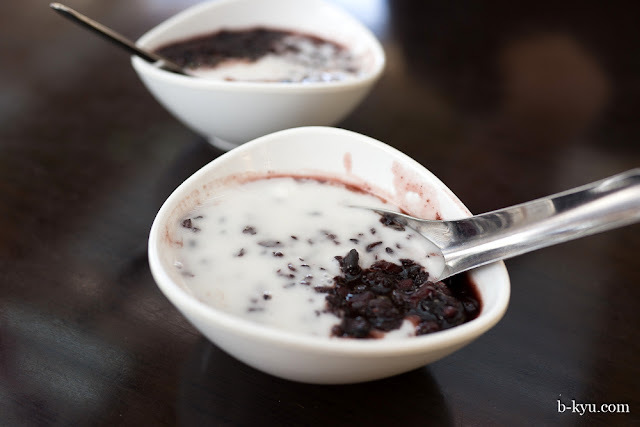 Black sticky rice with coconut milk, served nice and hot. 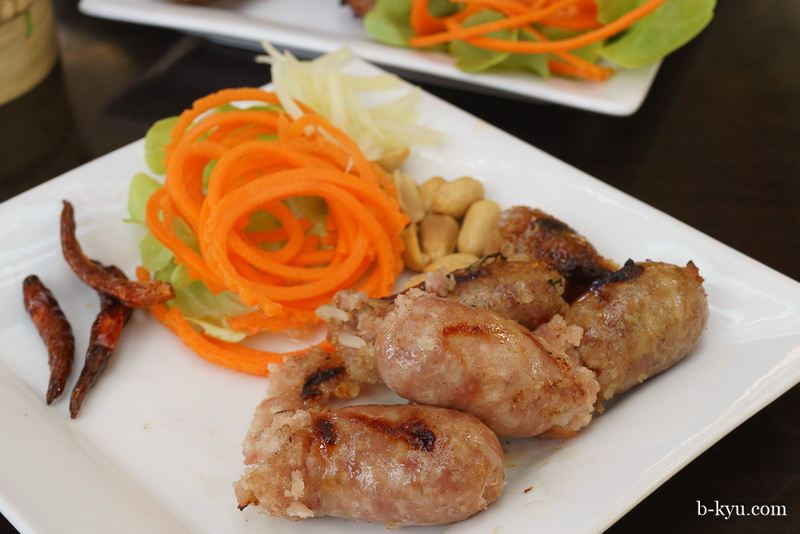 E12 Thai Esan sausage - $8.90. Grilled fermented pork sausage containing sticky rice sausage and served with sliced ginger. The deep fried crisp chillis on the side are a crunchy head blowing snacking fest. E13 Moo ping - $8.90. Three grilled marinated pork skewers served with sticky rice. 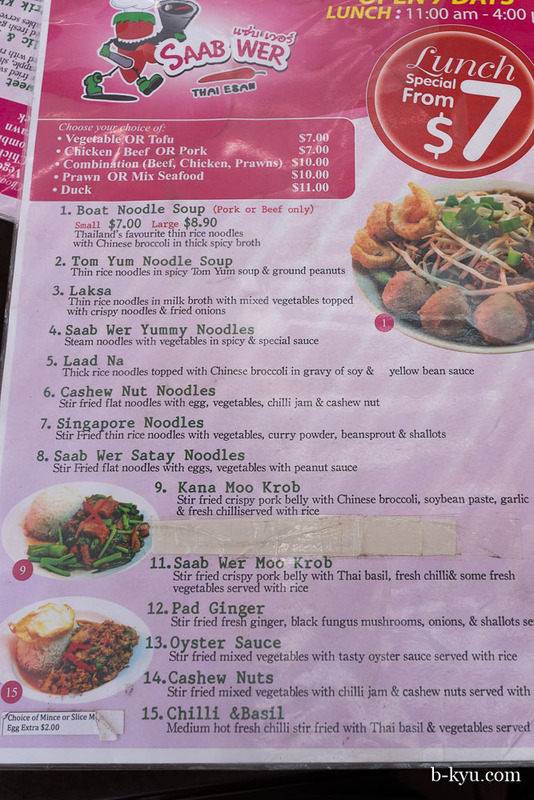 E6: Som tum tard - $19.90. 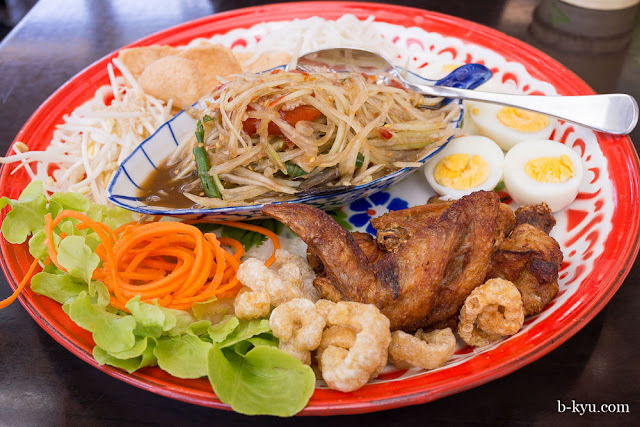 A mixed plate of spicy papaya salad, deep fried chicken wings, rice noodles, eggs, pork crackling, crackers and salad. The idea here is everyone takes a little of what they fancy and mixes it together on their own plate. You can choose which som tum you want in the middle, we went for a fishy fermented, salted crab version that played the Bootsy Collins funk all over our tastebuds. Those little crab legs are pure crunch and salt. 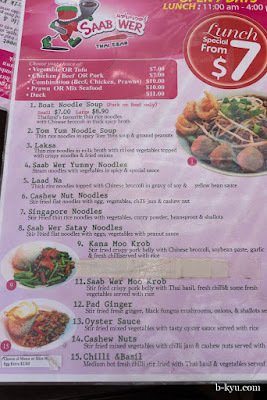 No 1 and E29: Boat Noodle Soup (large size) $8.90. The beef was just cooked and a little pink, so a quick dunk in the deep brown broth soon finished it off. While we often love a small serving, this is a good sized and generous soup. 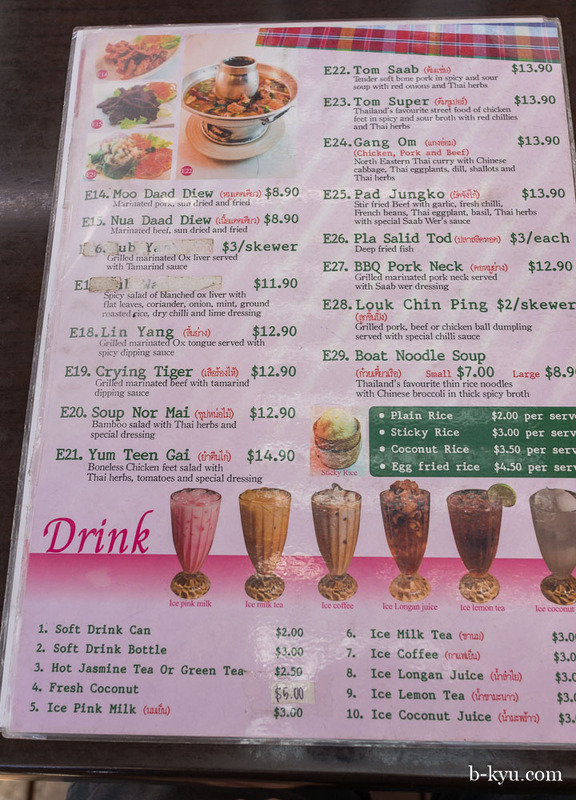 E4: Som Tu Mua, $13.90. Salted crab (oh so crunchy and super salty), fermented fish, pork crackers, beansprouts, pork roll (like Vietnamese cha lua), and spaghetti like rice noodles. It's like E6 all mixed up for you already, without the chicken wings and purdy tray. The classic table set. Any ideas where to get one of these to buy in Sydney? Saab Wer menu - click to enlarge. 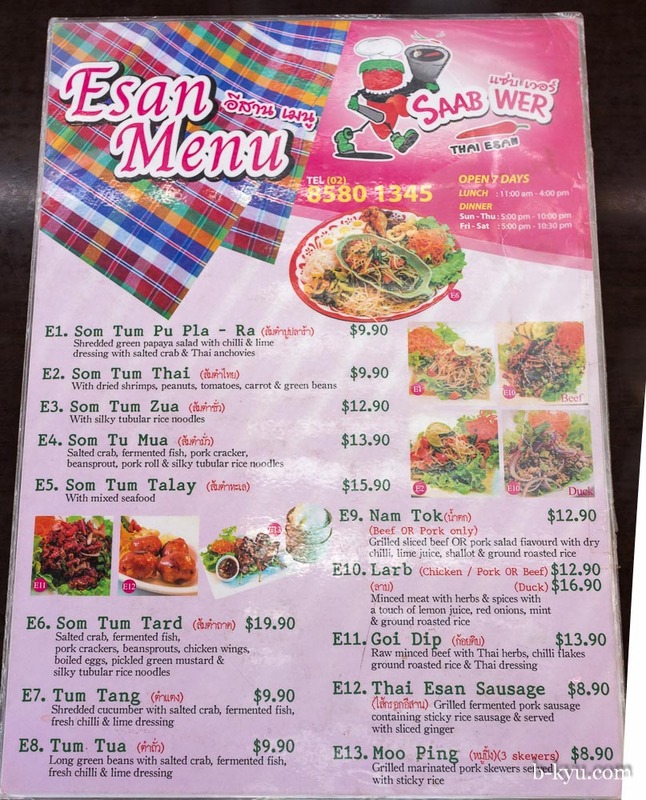 Saab Wer Esan (the good stuff) menu - click to enlarge. Saab Wer Esan is at 105 King Street (the City end), Newtown. Nice. Maybe this equals the balance now that Saap in the CBD has given way to that new branch of Me Oi. 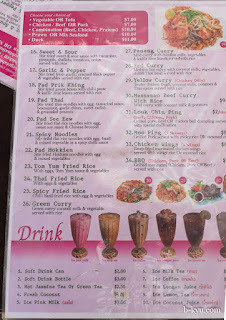 Pretty sure they sell the Thai cruet sets (aka puang) at Jarernchai, too, PS. Am pretty sure if you pop in or ring Lucky Thai on Campbell st in the city they could hook you up with a condiment caddy. The frozen foods outlet (next to their fresh veg and sweets video shop) stocks a lot of restaurant supplies. If they don't have it at the shopfront they may be able to bring it for you from the warehouse. I stumbled past this place a few weeks ago too - I tried the grilled pork neck, and hot and sour curry with prawns and cha om omelette and they were great. I hear what you say about Netwown thai food restaurants, but I do have a soft spot for Ladas Thai on King street. 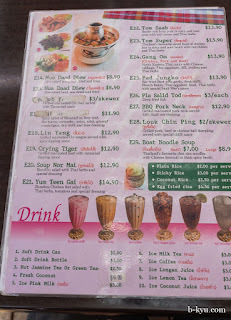 The menu is pretty standard, but they do the basics well, and they're cheap. Finally tried this. 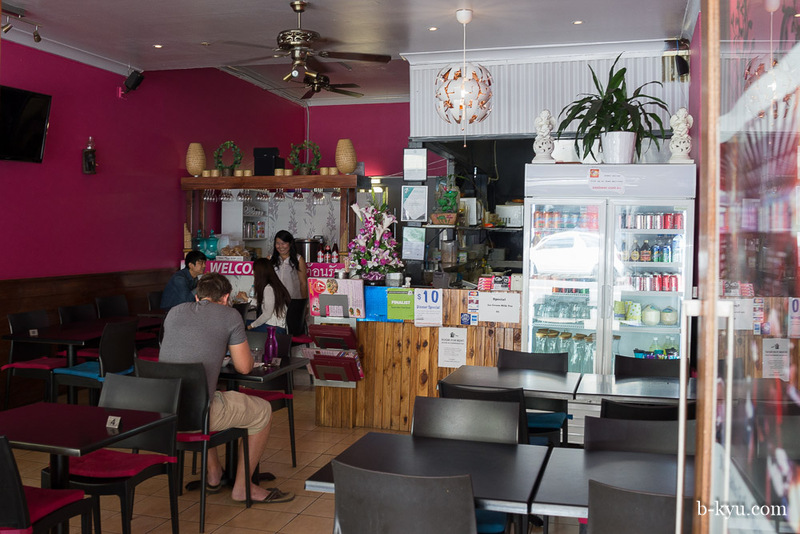 Best Thai in Newtown imo. Really liked it. Thanks for this, Nicholas. Good to hear!